This year, the Chanel Deauville Bag has returned differently. It’s no longer only crafted in Canvas and solid colors, but there are now more leather variations and designs available. For example, we’ve talked about the Studded Logo Deauville Bag recently. But there is more! The Chanel Deauville Bag has also returned in beautiful Camellia Logo print and we’re so obsessed right now. So introducing from the Spring Summer 2018 Collection, let’s talk about this. Some bags are made to be available forever; other handbags are made for one season. This Chanel Deauville Camellia Logo Bag is certainly the second one. Once this collection is over, this bag might disappear forever. This print hasn’t been featured on Chanel’s website, but there are many bags that can only be discovered at the boutiques. This new print is absolutely stunning as it’s designed in diamond quilting, but in a special way. In each center of the diamond quilting, there are CC logo’s and the Camellia flowers crafted. And if you think that’s incredible, then take a look at the body. 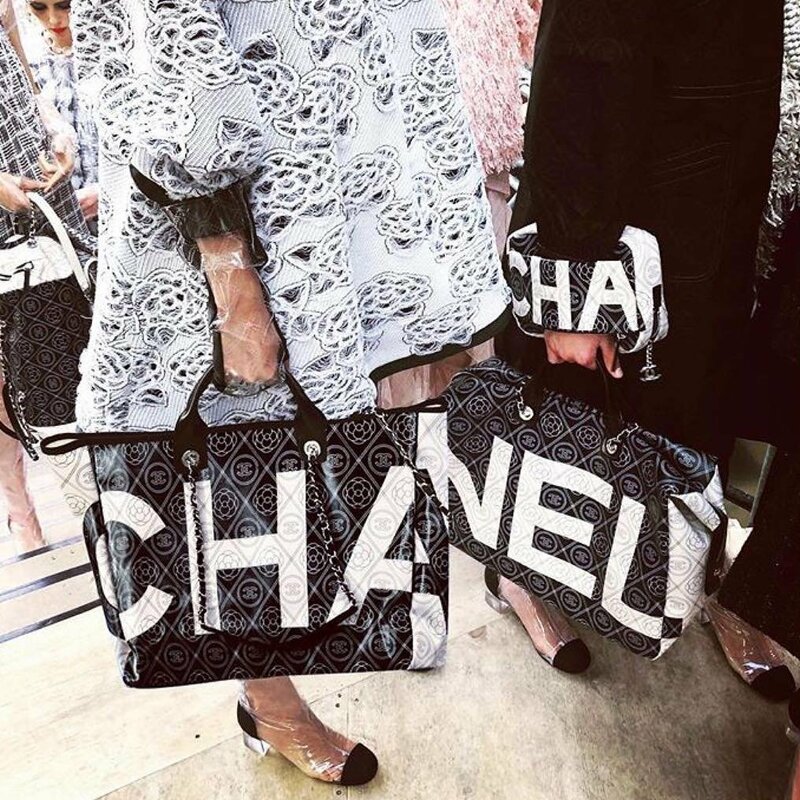 It’s made with one huge logo of the house – CHANEL – in white lettering. Can anyone ignore this? What’s more? It comes with an handle, but also long woven chain leather strap for shoulder carry. So what do you think? Is this love? The Deauville Bag is always spacious from the inside; it can even hold your laptop. The interior also features a nice zip pouch, in case you need to store some important essentials. The medium version is measured 11.8’ x 15.3’ x 8.6’ inches, we do not have the prices right now.